Shortly after Ibelieveinharveydent.com came online, a comic book store employee in Southern California reported that Joker cards were found in the shop, with "I believe in Harvey Dent too! Hahahaha!" rubber stamped all over them. This led to the discovery of Ibelieveinharveydenttoo.com. 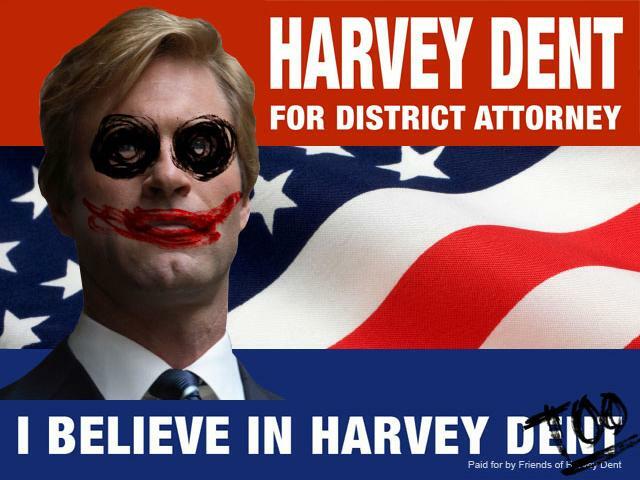 The webpage displayed the Harvey Dent poster from Ibelieveinharveydent.com, but altered Dent's face to include red lipstick and blacked-out eyes like The Joker. At the bottom of the page was an email sign-up form. By entering in the X and Y coordinates at the URL written at the end of the message, a pixel could be deleted to reveal a new pixel underneath. This could possibly be a reference to "Rory's First Kiss," the code name used for "The Dark Knight" during production. Another reference to a "kiss" would later be found in Rorysdeathkiss.com. After enough emails were registered and coordinates were entered, the second picture was finished and revealed to be the first picture of Heath Ledger as The Joker from The Dark Knight. This threat is identical to a sentence revealed in a Dark Knight casting side that was released on April 1, 2007. This would later prove to be more than an idle threat: one of the two online prizes for completing the cake hunt were tickets to a showing of the film's prologue, thus allowing the audience to "see" the Joker in December. 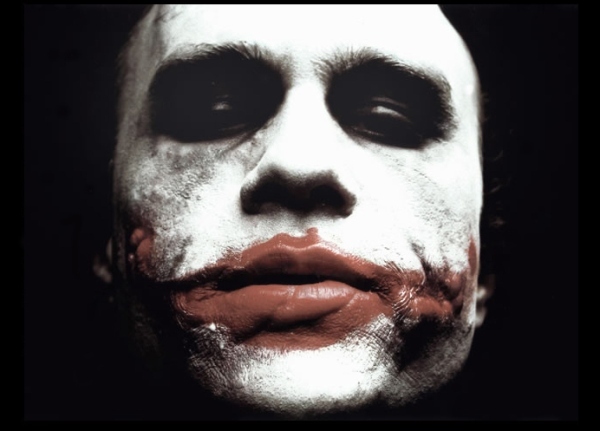 In July 2008, Whysoserious.com updated with a checklist of Joker trails that included the following report regarding Ibelieveinharveydenttoo.com. GPD REPORT OVERVIEW An unknown suspect employed the help of thousands of goons in his efforts to terrorize local politics by defacing Harvey Dent campaign materials. The crimelord then showed his face for the first time on-line, prompting legions of followers to join his latest cause, the nature of which is still unclear. DETAILS: Enter details of offense/incident. Shopkeepers throughout Gotham began discovering playing cards with the words "I Believe in Harvey Dent, Too" scrawled across their surface. THis was a sly reference to the politician's campaign website, Ibelieveinharveydent.com. Citizens entered Ibelieveinharveydenttoo.com into their browsers, and were shocked to discover a vandalized campaign poster, depecting Dent as a demented clown-type figure. Despite a citywide transmission from the GPD warning citizens against any and all contact with this potentially dangerous individual, thousands of people began offering him their e-mail addresses, thus joining his crew of wanted criminals. Participants were encouraged to "peel off" Harvey Dent's skin, though no direct threat on the assistant DA's life was ever proffered. MCU attempted to take down [[Ibelieveinharveydenttoo.com, but the security code could not be cracked. As more e-mail addresses filtered into the pirate website, they triggered a chain reaction which transformed the image of Harvey Dent, unraveling a photo underneath. The subversive photo on Ibelieveinharveydenttoo.com was fully uncovered and the suspect's face was finally revealed, although it remains to be seen whether or not this image was a decoy to throw us off the trail of the actual perp. Some officers theorized that this might be "The Joker," though many believe him to be an urban myth. The offending website disappeared and was replaced with an error message. After careful examination, the "error" page was found to contain a hidden message which merely consisted of a series of "Ha, ha, ha" phrases, repeated dozens of times maniacally across the page. These words, once decoded, unveiled a cryptic threat warning readers that he would "See you in December." The switchboard at police headquarters was inundated with thousands upon thousands of calls. Gotham citizens were immediately frightened at the hideous visage of this new, ghoulish menace and they wanted answers as to how we were going to pursue him. Harvey Dent was urged to hire additional personal security personnel, but he refused. This series of events was as exhaustive as it was enigmatic. Though the alteration of Harvey Dent's campaign poster was grotesque, there was no physical vandalism perpetrated within the Gotham city limits. We must proceed with caution, however, due to the immense scope of this swelling crime syndicate. This page was last modified 18:26, 24 April 2012. This page has been accessed 80,402 times.